Wanna buy a slightly used Leatherface? Dude should probably wear some armor. 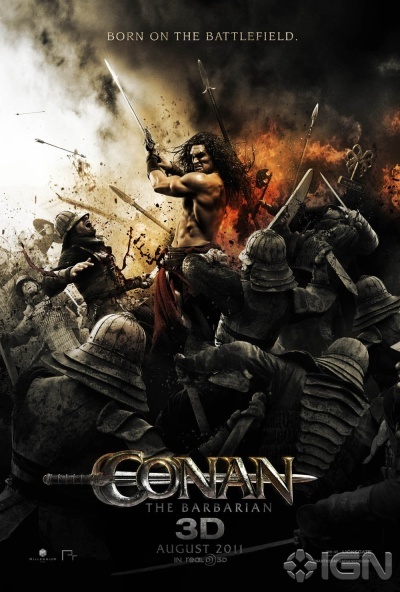 The latest trailer for the new Conan the Barbarian film was a lot bigger than I expected. From my perspective this always seemed like a low rent capitalization and not a Clash of the Titans-esque smash circus. It still scares the crap out of me but at least it appears to be rather big and aiming for the core. Jason Momoa, though good in his nearly mute role in Game of Thrones, still also troubles me but we’ll just have to wait and see. Here’s the poster. What do you think, Chewers?